Two years ago today, Sushi Day was introduced to the world. On only our second day live, we got a very warm welcoming, and significantly more traffic than we had ever expected. From there, things only got better. A year ago, we began selling shirts, and just a month ago I introduced you to my new food blog. In celebration of two years of fun, crazy, delicious sushi, I decided that I would highlight some of my favorite sushi I’ve made in the last couple of years. These are all must-try recipes that I’ve made and loved. 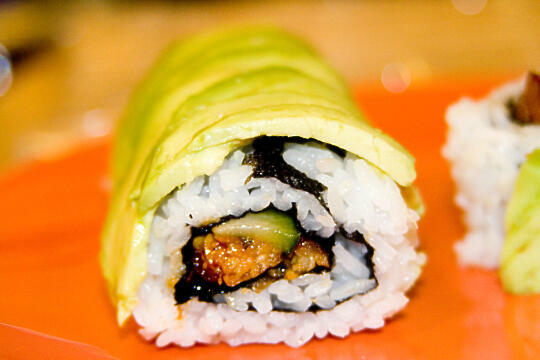 Do you have a favorite roll on Sushi Day? Or maybe your own creation that you love to make at home? Tell me all about it in the comments! 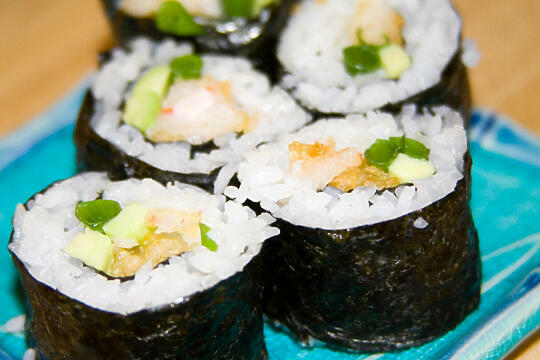 Of all the rolls I have ever made on Sushi Day, the Crunchy Shrimp Roll is the most popular. Not only is it incredibly simple to make, it’s also quite difficult to find anyone who doesn’t like these ingredients! This roll has made an appearance at my family’s New Years celebration ever since I launched Sushi Day, and probably will for many years to come! 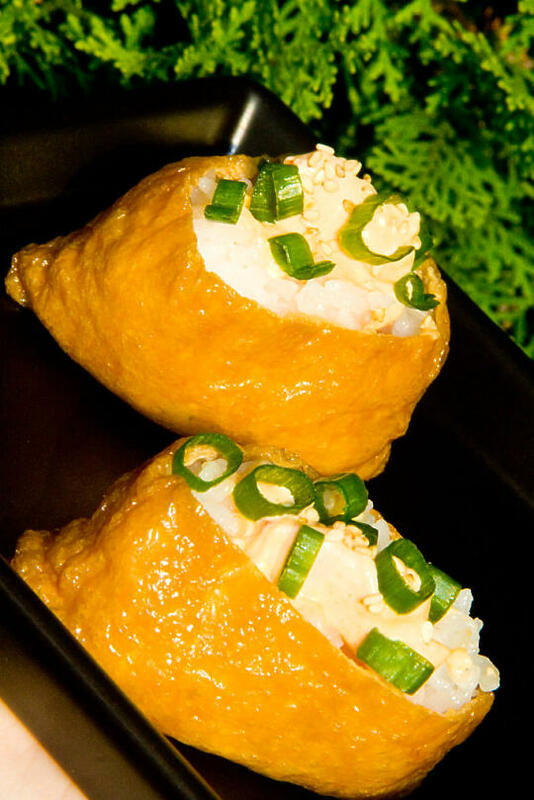 For me, Inari Sushi is a classic. This was the first sushi I ever ate, and I’ve loved it since I was a small child. It’s a little sweet and a little salty, and even picky kids will eat it – believe me, I was among the pickiest as a child! The Caterpillar Roll was the first inside-out roll with some sort of topping that I ever made, and I was surprised at how nicely it turned out! 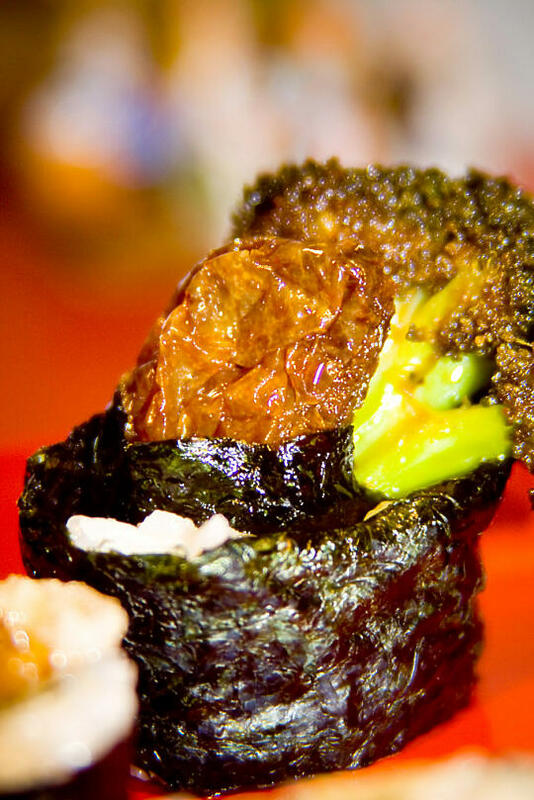 Sure, sushi topped with avocado or other toppings seem intimidating to make, but they’re really not very difficult at all. Dear Yvo, one of the first commenters on Sushi Day and definitely the one who has stuck around the longest, came up with the idea for Monkey Maki. This was my first time ever tempura-frying anything… who knew you could tempura-fry a banana? And who knew it would be so yummy? Tuna Salad Sushi is another of my favorites. 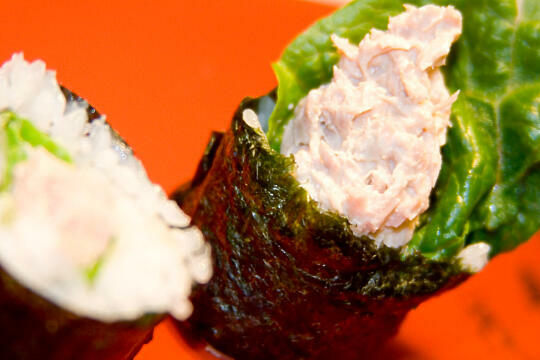 I had tried tuna salad sushi from Bristol Farms before, so I already knew it would be a winner. Making it at home – just as amazing. Plus, you can make the tuna salad however you like it. Living with Son, it’s hard to completely avoid spicy foods, so it wasn’t long before spice began to make it’s way into my sushi. 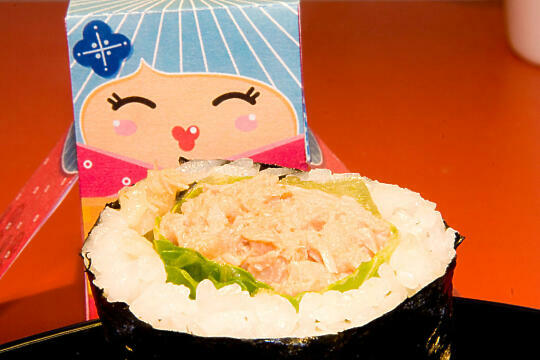 Hence the Spicy Tuna Salad Roll – so similar to the non-spicy one, but with the extra kick of Sriracha sauce. The Crazy California Roll was a roll I had first tried on my eighteenth birthday, when Son took me to a local sushi restaurant. Ever since then I would always get this roll whenever we went back, and I was happily surprised when it tasted just as great when I made it at home. Throughout college, I lived only a few minutes away from a banh mi (Vietnamese sandwiches) restaurant. Inspired by those sandwiches I love so much (and crave so often), the Banh Mi Sushi became another favorite of mine. It takes a lot of work, but oh my goodness is it worth it. Oh, SPAM. What a poor, misunderstood product. So many people bash it just on principle, but if only they had one taste of Spam Musubi, I’m certain they would change their mind. Although my favorite way to eat SPAM is still scrambled in eggs, Spam Musubi comes in at a close second. 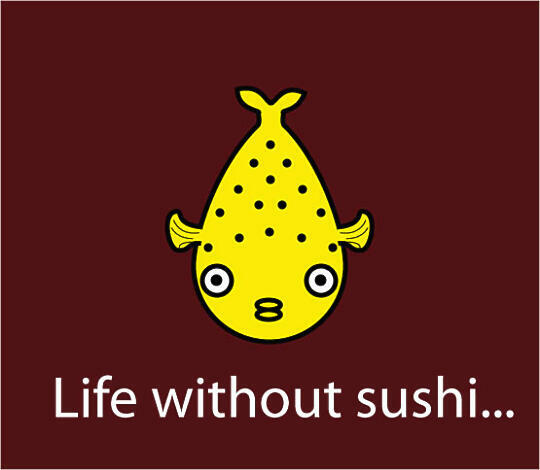 I know I have many vegetarian or vegan readers, who just can’t eat most of the sushi I post because, well, fish? Yeah, not so much. Lucky for them, I have made quite a few vegetarian and even completely vegan (I think) sushi. Take my “Beef” and Broccoli Maki, for example. 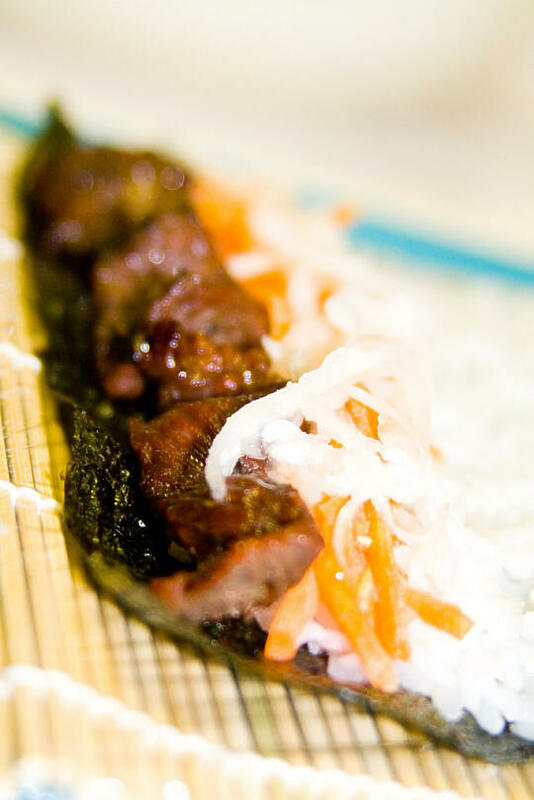 It’s not really made with beef – the “beef” is actually fried tofu, marinated in a teriyaki sauce, then sauteéd with broccoli. 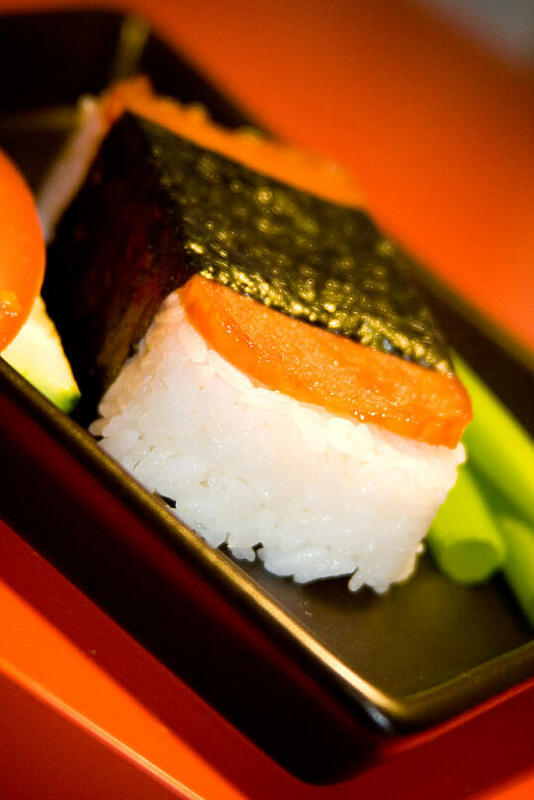 Inspired by my favorite vegetarian Thai restaurant, this sushi is vegetarian-friendly, and amazingly delicious. 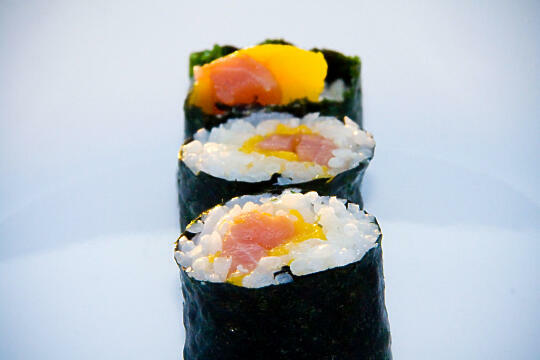 The Mango Salsa Sushi is, in my opinion, one of the most beautiful rolls on Sushi Day. 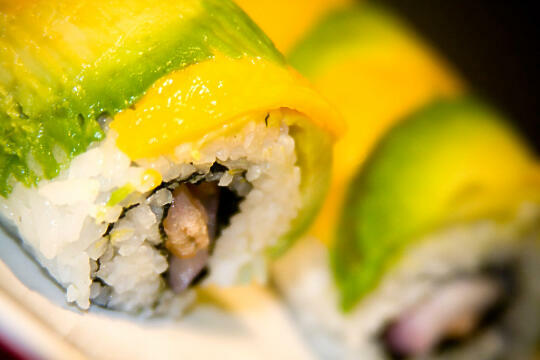 The alternating yellow and green of the mango and avocado, not to mention the purple and pink from the red onion and shrimp, result in a very beautiful (and delicious) roll. 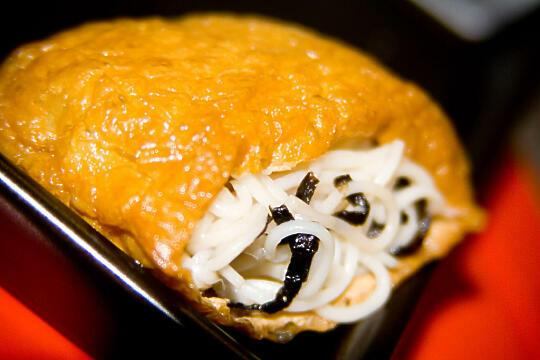 Stuffed Somen Salad is another beloved dish from my childhood. My great-aunts used to make stuffed somen salad every year for our family Christmas party, and my grandmother would sometimes stuff inari packets with the somen salad. Amazingly delicious. And, if you leave out the imitation crab (which we do because my mom is allergic), vegetarian! My sister has been a great source of ideas for sushi. Every now and then she’ll message me with, “hey, I’m coming home… want to make me sushi? 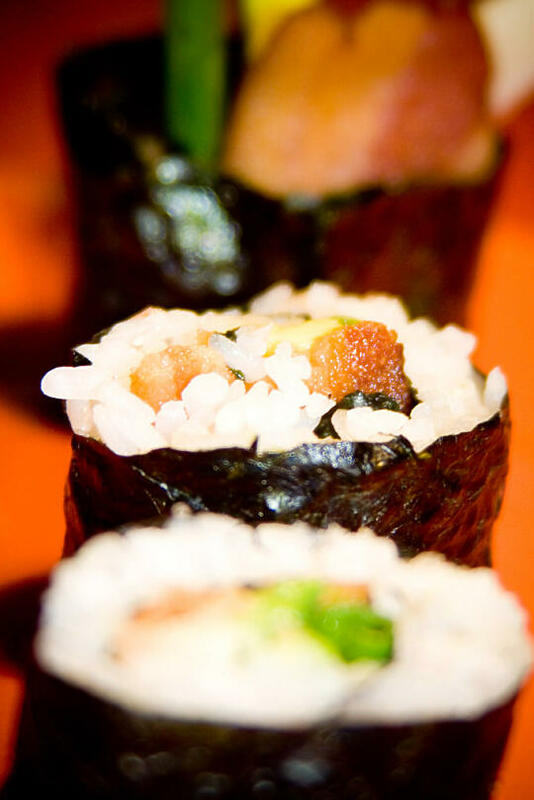 I think you should make me sushi with these ingredients…” Since she came up with this amazingly delicious (unorthodox, yes, but delicious nonetheless) roll, I thought it only fitting to name it after her. Thus, the Kristen Maki. 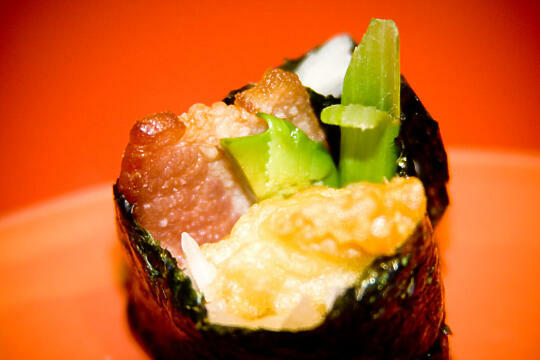 The Bacon Crunchy Shrimp Roll. Because bacon makes everything better, and this was no exception. Unagi = yum. 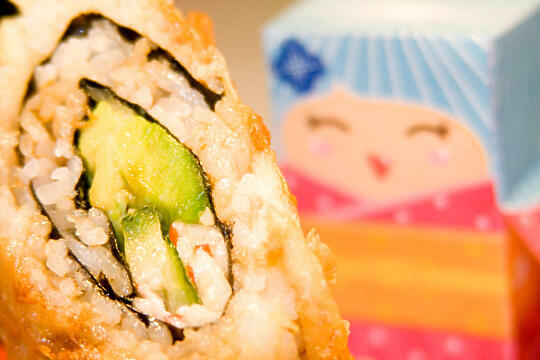 California Roll = yum. 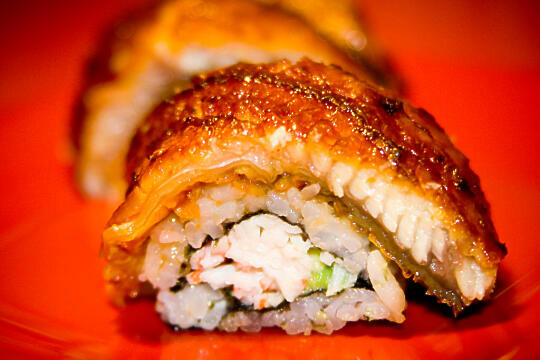 Unagi + California Roll = Super California Roll = yum². 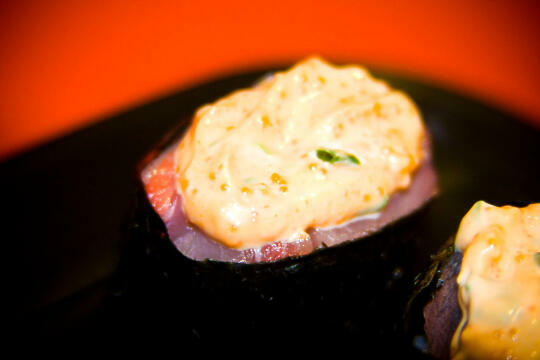 The Maguro Karakuchi Spicy Tuna is another favorite of mine. 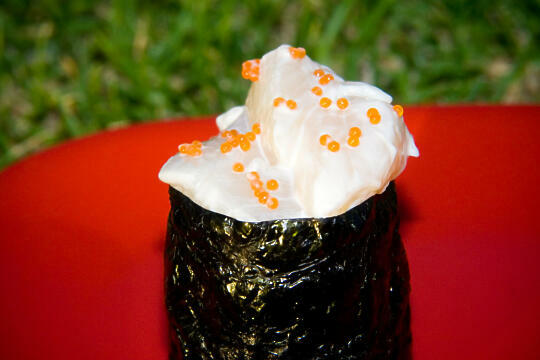 The sauce in this roll is nothing short of amazing. In fact, I use it not only for sushi, but also as a spread, mixed into tuna and egg salad, and to dip sashimi in. Seriously. Amazing. What? I told you I love this sauce. Of course I had to use it for my Spicy Hamachi Gunkan. Sometimes, simplicity can be amazing. Such was the case for the Mango Tuna Tango. 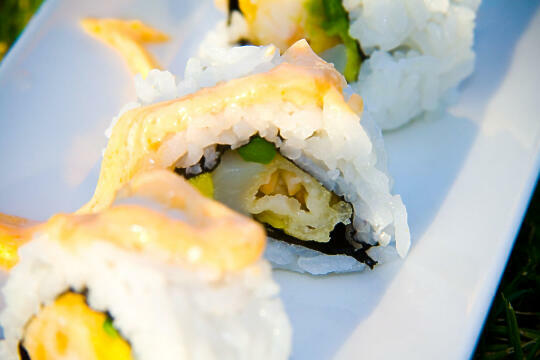 Nothing more than tuna, mango, and a little Sriracha sauce go into this roll, but they all combine to create an explosion of flavor in your mouth. 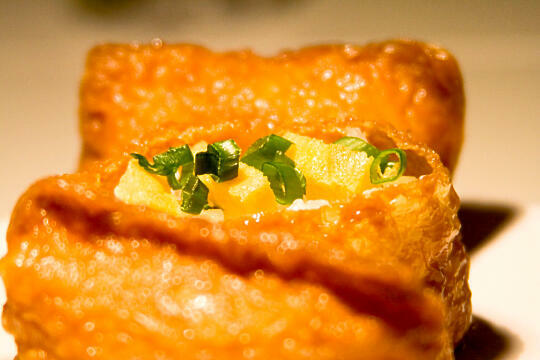 When I first tried Spicy Shrimp Inari from Whole Foods, I knew I had to recreate it at home. I didn’t think anything could make my classic favorite any better, but man was I wrong. This is probably the sushi that Son and I eat the most – any time we feel like sushi I make this because heck, it’s so dang easy! Hotate (scallop) has quickly become my favorite type of sashimi, as was in evidence on my Hawaii trip. My first attempt at using hotate in a roll was when I made the Santa Barbara Roll, and my goodness was this a success. Amazing, amazing, amazing all around. My first encounter with hotate was in Sunnyvale, when I tried the Hotate Special. This was one of those rolls that I knew I would have to recreate at home, and it didn’t fail to live up to my expectations when I made it at home. 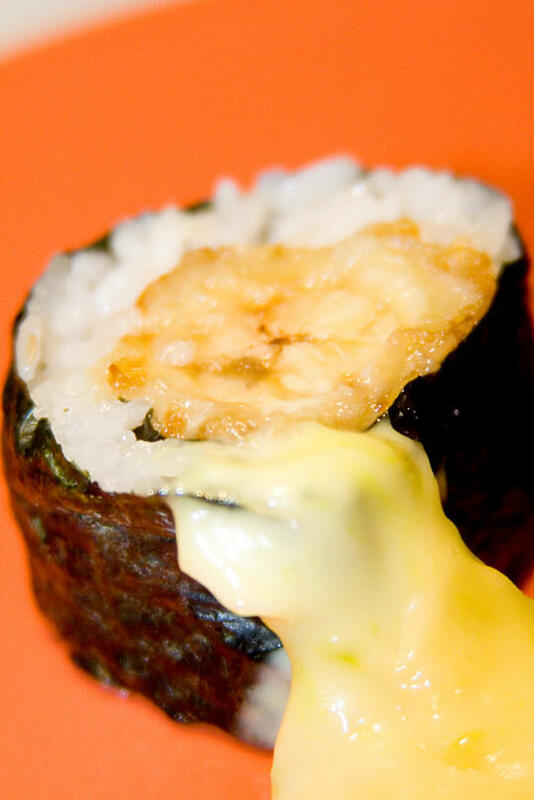 My last must-try recipe is not a sushi recipe, but it’s amazing just the same. 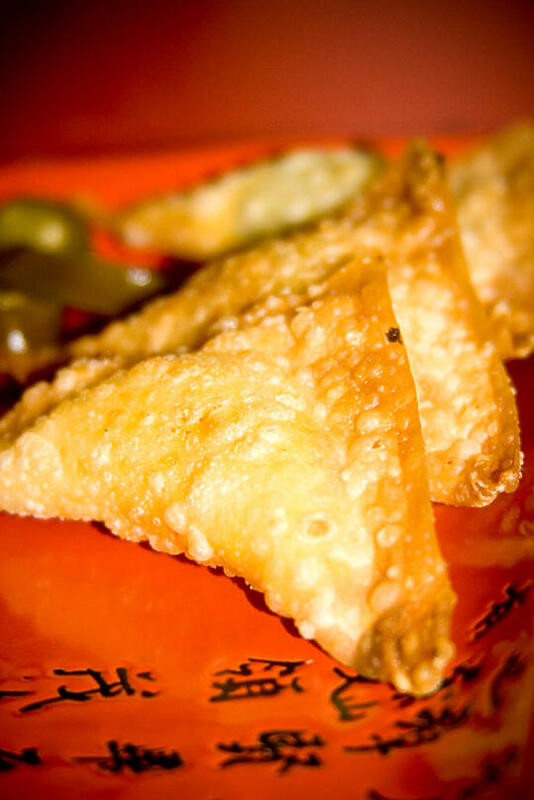 Cheese Age are wontons filled with cheese and jalapeño, then deep fried until crispy. They are incredibly addictive, and although quite spicy, it’s hard to stop at just one. So thank you for sharing two years of sushi with me, and here’s to many more! Tamago will always be my favorite! 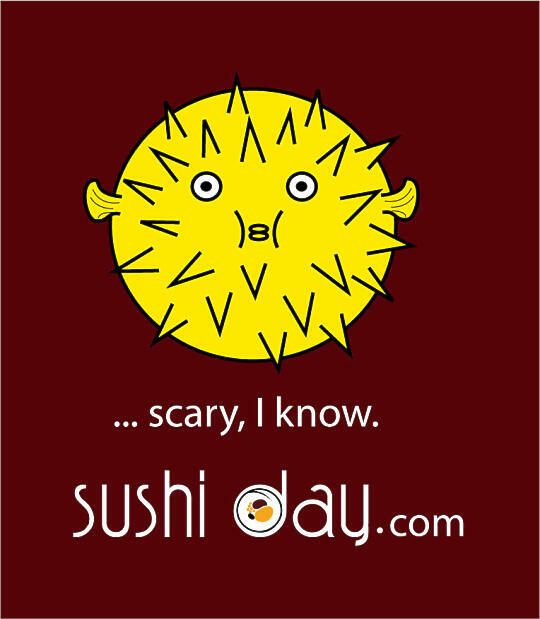 Happy Birthday, Sushi Day! We’re older than you by about 3 days, but your blog is something we aspire to. I haven’t had a good inari sushi in so long. The Stuff Somen Salad is an excellent idea and it’s easy to make. Congrats on the 2nd anniversary of the blog. Loved the pics as they’ve reminded me of the rolls I’ve had and those that I still plan on making in the future. Marie’s last blog post… Sad Lunch… NOT! NIce job Allison. Happy Birthday. 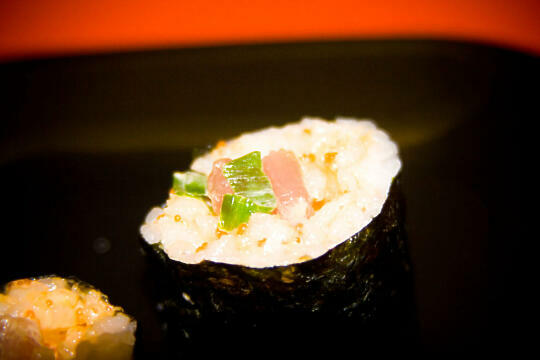 Im sushi cooker from venezuela and i like very much this blog. Your sushi is very Yummy !!!. I hope you keep making sushi for a long time. Ahh good looking t-shirts ! Congrats to two years and here is to two more. Yvo – We were incredibly lucky to be featured on LifeHacker on our second day live… I have a feeling that might be how you and Ralph Whitbeck both found me. I’m so glad you did! Damien – I’m sorry to say I don’t remember you (I get a lot of emails, sorry!) but I’m very glad to hear I could be helpful to you! Thank you!